If you ever played high school sports, you heard something like this statement from your coach, as he told you no matter how bad the score was during the first half, if you continue to play and play well, you can still win. Distilled down to its essence, this is the principal life lesson that participation in any competitive sport and every game teaches. There are other significant benefits that may be derived from athletic activities such as physical conditioning, learning teamwork, striving for a common goal, supporting a cause and gaining personal satisfaction from your efforts. These are all important, but the most important lesson is to never quit. Adapt, keep trying, look for opportunities and capitalize on your opponent’s mistakes are all words that your coach told you again and again. Making the transition from sports to life coaching, finds those professionals using exactly the same language. The goal has changed. Now you are doing something more important than trying to win a football game. You are trying to turn your life in a more positive direction. Everyone is going to take some lumps in life. Many times these are from outside sources that are completely out of your control. Bad things do happen to good people. These can come from any direction and sometimes from different directions at once. When hit by a cascade of simultaneous adverse events the obvious mental questions are, “What do I do now?” which is best answered by another question. “What is the next step that I can take to improve my situation?” All forms of training in competitive sports, in the military or in business distills down to teaching the player, recruit or executive trainee to automatically consider and answer these two questions. In combat there is no time for protracted deliberations. The reaction must be immediate or lives may be lost. The same is true when families are faced with natural or man-made disasters. Perhaps you have never been involved in a natural disaster where your life was at risk. It is likely that someday you will experience a flood, fire, earth quake, volcanic eruption, epidemic, conflict, tornado or the like. These things will occur and it is best to prepare for them by having an escape plan, stockpiling needed supplies, medications and pre-thinking where you can go to take your family to safety. Physical survival is the most important activity. The next most significant activity is economic survival. Help from your neighbors, public and private charities and governmental organizations may provide immediate aid in the case of physical disasters, but resources are often scarce to non-existent when faced with economic disasters. Unemployment insurance and severance packages, and perhaps even back pay for workers, can help, but these benefits are time-limited. Take advantage of whatever is offered, but also use this time to plan your own economic survival program by starting your own business/es as and when you need them to raise immediate money and provide for your family’s long term financial security. If you are in life you are in business, whether you realize it or not. Every day you are buying and selling something. That something may be your services as an employee, but you are indeed selling a product. Even if you are digging a ditch as a contract employee and being paid under the table, you are selling your muscle power for a given period for a given amount of money. This is a business transaction. So to say, “I am not in business,” is incorrect. Yes, you are in business and have been nearly all of your life, but just in different ways. Discovering and starting successful businesses might be just a one-off event, a series of related events or an exploration into many short-term and long-term activities. Some have started nearly continuous yard sales. Others have sold their collectables on e-Bay. Yet more are providing services such as yard work and shopping for their neighbors. Maybe you can engage in house cleaning or car detailing. Any of these can generate short-term revenue. We are all differently afflicted and gifted. One of the objectives of elementary and high school education is to expose students to a variety of potential life activities and identify the areas where the students are most likely to succeed. Unfortunately the position of “Guidance Consular” has now been eliminated in many high schools. This duty is now shared among all the teachers with the result that it is largely not being done at all, except where a teacher may take time to interact with a student during a decreasing number of extra-curricular activities. Tragedy and triumph, addiction and recovery, pain and pleasure, damnation and redemption, trials and success are all part of life. If you wish to get into religious topics you can also add death and resurrection. The fight to convert tragedy, addiction, pain, damnation and other personal trials into a successful outcome is a tale worth telling. A story that is relatable to many others, and a way to provide income while helping others. You may wish to participate with a non-profit organization to assist others in a rehab program. Perhaps you might even start such a program on your own if your community has unmet needs. Such programs have many levels of participation. 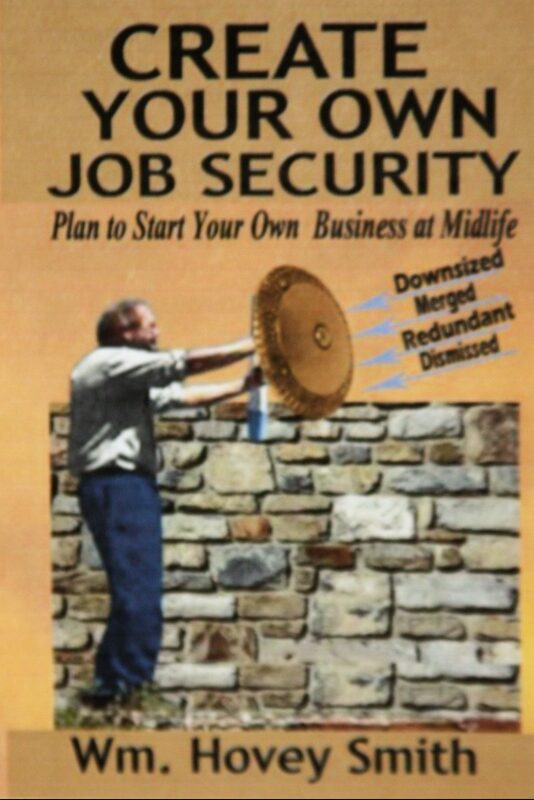 My most recent book, Create Your Own Job Security: Plan to Start Your Own Business at Midlife, has chapters which explains exactly how to select potentially successful business opportunities from a list of alternatives that you have developed. From this list you sort into short, medium and long-term opportunities; and devise a plan to work towards their successful implementation. The ultimate objective is to find a business that you love to do so much that you would do it even if no one paid you and discover how to make it a profitable enterprise. Like the fighter I started out with, you stay in the fight, keep slugging and give these adverse aspects of life a few good punches in the nose. If I can help you get started I offer a convenient consulting service that you can use by using the contact form below. Tell me what you want to discuss and if I feel I can help I will set up a half-hour telephone consulting call for $100 which will be followed up by a written report.